Welcome to the Grand Theft Auto 5 Under the Bridge locations guide that helps you find the total of 50 Under the Bridge Events locations & successfully finish them for the Xbox 360 & PS3 open world action-adventure game. * “Close Shave” (20 Gamerscore / Bronze Trophy) — Complete all Under the Bridge and Knife Flight challenges. The Timeline for all these in-game Under the Bridge locations is listed below. Tips: First off, get a Maverick helicopter from the South Los Santos hospital helipad. If the Maverick doesn’t spawn, go down to the street and up to the helipad again. You can complete all 50 Under the Bridges with it. Most of them are really quite easy. There are just a few hard ones. Second, if your helicopter gets massively damaged, you can use the quick save and immediately reload the game. It will automatically be repaired when loading the save game. Also make use of quick save before attempting the harder Under the Bridge challenges. How to learn to do Under the Bridge flying? : To get better at Under the Bridge flying you should visit the Flight School at Los Santos Airport. You might also want to max out the “Flying” statistic of one of your characters to have more control over your aircraft. Trevor comes recommended. Note: The plane will fly more smoothly with the landing gear up. Once you’re in the air press down on the left analog stick to pull up your landing gear. Does the game save each Under the Bridge you complete? : Only if you have automatic saving turned on. If you don’t have auto-save on, the game will ask you if you want to save. So for the Under the Bridge flight you just completed, you don’t have to play to the end of a mission. 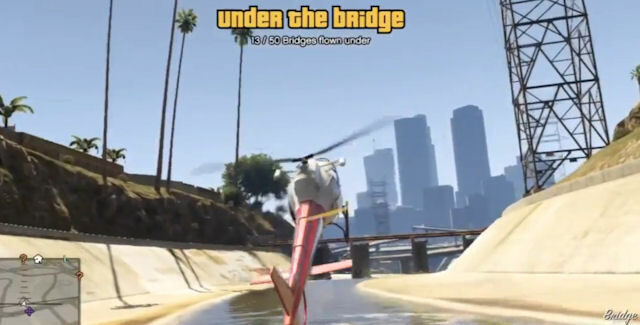 Where to find all Under the Bridge in Grand Theft Auto 5? The in-game collectibles locations for the Under the Bridge are described in this detailed video guide. The Under the Bridge are listed in the video in the order that they appear. Please comment if you have any additional Grand Theft Auto 5 Under the Bridge location tips of your own, we’ll give you credit for it. – Thanks for visiting!